On her thirteenth birthday, Mariama leans against her favourite baobab tree and daydreams, thrilled that the time has finally come for her Sande ceremony, when she will officially pass into womanhood. But then, rough hands tear her from her daydreams and violently toss her into a nightmare reality. She is forced onto the SS Archery, a slave ship that steals her from her home in West Africa and delivers her to the British colony of Demerary on the northern coast of South America. 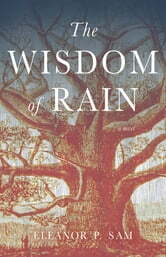 The Wisdom of Rain is a sweeping tale of tragedy, loss, and inhumanity, but it is also a story of courage, love, and spirituality. It shows how these qualities can transcend and defeat servitude and suffering in the most trying circumstances. It is a novel that treasures and restores the past, breathing life into a forgotten time and place and revealing its hidden pathways to the present.